Home > Analysis > Who Will Be Liverpool’s Most Important Players? Who Will Be Liverpool’s Most Important Players? I imagine that I’m going to be writing about this being a season filled with promise all the way up until it’s no longer possible for us to win trophies. I don’t remember the Reds having a combination of a decent playing squad, exceptional manager and all parties involved in the club pulling in the same direction during my adult lifetime. Add into that the turmoil bubbling underneath the surface at Old Trafford, the fact that Tottenham Hotspur didn’t buy a player this summer at the same time that their stars from last season look dead on their feet, and the notion that no one’s got any idea what’s going on at Arsenal and you can see why I think the league should be our number one target. Pep Guardiola’s not an idiot, of course, and he knows that he’s been brought in to The Etihad to build the Cityzens a legacy in the same way that Alex Ferguson did at Manchester United. There’s also Chelsea, who should be under-estimated at your peril. Yet trouble is never far away at Stamford Bridge and I firmly believe that City will be targeting the Champions League as a matter of priority. That leaves a tender gap for the Reds to try to get into; a moment in the club’s history that hasn’t really been around to be exploited before. As a result, I will keep banging on about my opinion that Jürgen Klopp and his team should have their eyes on one prize above all others: the Premier League title. As mentioned a moment ago, this is a strong squad. From back to front, the team is filled with players that have the ability to do something special in their own department and that means that the rest will be needing to up their game. It also somewhat naturally begs the question: Which Liverpool players will be the most important as we attempt to compete on four fronts? In other words, should the manager need to make a choice about who to play in a Premier League match one day and then a Champions League the next, who should he favour for each of the tournaments? I’ve had a little think about my opinion on the matter and will explain here why each of the players are vital heading into the rest of the campaign. If you asked most Liverpool supporters to pick the defender that they thought would be most important going into the business end of the various competitions that we’re involved in then the most obvious and common answer would definitely be Virgil van Dijk. Clearly I agree with that entirely, given the extent to which the Dutchman has transformed our defensive unit. Now that Alisson Becker has joined him at the back, there’s even more of a cohesive unit at the back and van Dijk is the centre of that. Yet I’ve opted for a much-maligned man at the back as my most important player in Dejan Lovren. The main reason why is that van Dijk will miss some games at some point during the year. Hopefully injuries will be few and far between and he’ll recover from them quickly enough, but whether he gets a tweak or is rested, we’ll need to see him on the sidelines every now and again. ️ “I’m one of the best defenders in the world.” – Dejan Lovren.  without Lovren: Lose 6-0 to Spain. When we don’t have the Dutchman in the side, then, we’ll need a senior defender to step up to the plate and lead an otherwise youthful side as best he can. Alexander Arnold and Andy Robertson have both established themselves as our first-choice right and left backs respectively, but that means that some people forget how young they both are. Robertson is the more mature, yet he’s only twenty-four. Joe Gomez has been a revelation so far this term and is, in my opinion, van Dijk’s main choice centre-back partner now. He’s still just twenty-one, though, and will face many more challenges in the coming months. We need someone at the back to step up to their own billing as ‘one of the best defenders in the world’, and Lovren can become our main backup to Virgil. Let’s be honest, Joel Matip has done little to show it should be him. Everyone knows that I’m a massive Jordan Henderson fan, believing that most people have simply no idea how challenging it is to be a midfielder in a Jürgen Klopp team. The club captain regularly gets picked by the German and has recently been given a new contract, so it’s odd to me that people who think the manager is amazing also seem to think that he’s somehow been tricked by Hendo regarding his playing ability. The former Sunderland man has virtually re-invented himself to become our defensive midfielder, but it’s a position that I don’t think suits his all-action nature. I think he’s great at turning over possession, but he’s sometimes found wanting when it comes to his position in the role of the six. For that reason, I believe that player that could prove to be the most important to us this season is Fabinho, with the Brazilian seemingly coming in to make the DM role his own. It’s intriguing to me that the manager waited until now to bring in a specialist defensive midfielder at the same time as he sold Lucas Leiva and Kev Stewart; the two players being the ones who could do that for him when he arrived. In fact, Lucas played as a centre-back under Klopp than a DM, which tells you quite a lot I think. Perhaps, then, the manager has decided that it’s time to offer the defence genuine protection in the bigger games if we’re hoping to truly challenge for the Premier League title. After all, whatever you think of the player, it’s noteworthy that Leicester City and Chelsea won back-to-back titles when they had Ngolo Kante in their teams. Henderson will still have a crucial part to play this season, but I do wonder whether he’ll be used further forward now that we’ve got Fabinho and therefore believe that the Brazilian could be crucial to any success we enjoy. As with Virgil van Dijk, there’s a clear standout when it comes to our forward players and the one that’s most important, given that Mohamed Salah scored forty-four goals in all competitions last time out. I’m not convinced that he’ll be able to reproduce that form this year, but I think that there’s another man in the forward line who could be as influential to any success we enjoy: Sadio Mané. The Senegalese international has already started this campaign in blistering form, scoring in all but one of our matches thus far. With opposition defences distracted in looking after the Egyptian King, more space is opening up for Mané to attack and he’s licking his lips as he does so. Roberto Firmino was the most crucial cog in the Liverpool attacking machine last year, opening up the space to allow the other two forwards to get into. This time around I think it’ll be Mané who causes defenders the most headaches. Some people fear that a successful season from Sadio will see him leave for the shores of Real Madrid more quickly, but I don’t think that we can worry about that sort of thing. The only deterrent we have against players leaving for bigger clubs is success, with the likelihood increased that Mané will remain on Merseyside if we have picked up a big piece of silverware by the end of this season. As seems to have been re-invented by Jürgen Klopp as more of a ten than a winger or forward, dropping deep and picking up the ball in similar positions to where Philippe Coutinho did when the Brazilian was at Anfield. After his departure to Barcelona, everyone expected the manager to go out and but a replacement but it’s now seeming likely that instead of that he’s just tweaked Mané’s role, even allowing him to literally wear the number ten. If we’re to win stuff this year, the Senegal international is likely to be a crucial part of why. Last but not least, a quick mention for a player that few people were excited about us signing during the summer but who could go on to make all of the difference. 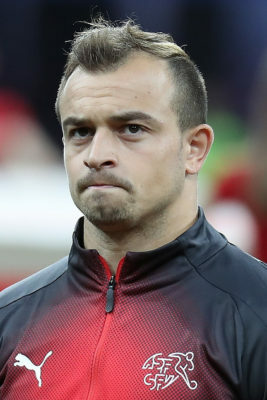 Xherdan Shaqiri wasn’t a name that many people had palpitations over when his transfer to us became clear, but I think he’s going to go on and be a difference maker as the campaign progresses. He’s already shown glimpses of some things that few people thought were in his locker, holding the ball up brilliantly when we needed to see the game out against Leicester City just before the international break. Are There Alternatives To Our Transfer Targets?